For most D/X refrigeration-based dehumidification systems the traditional method to provide air conditioning to the space was to add an outdoor air-cooled condenser and reject the absorbed heat to the outdoors via the refrigerant. When the application installation requires a very large distance between the unit and the condenser, it becomes challenging to design and execute a proper refrigeration line set for proper pressure drop and oil return. When this is the case, a fluid cooler would be considered as an alternative method of rejecting the heat. Lately a design fad has been to use a fluid cooler even for short line set designs. The main reason provided is to reduce the refrigerant charge. 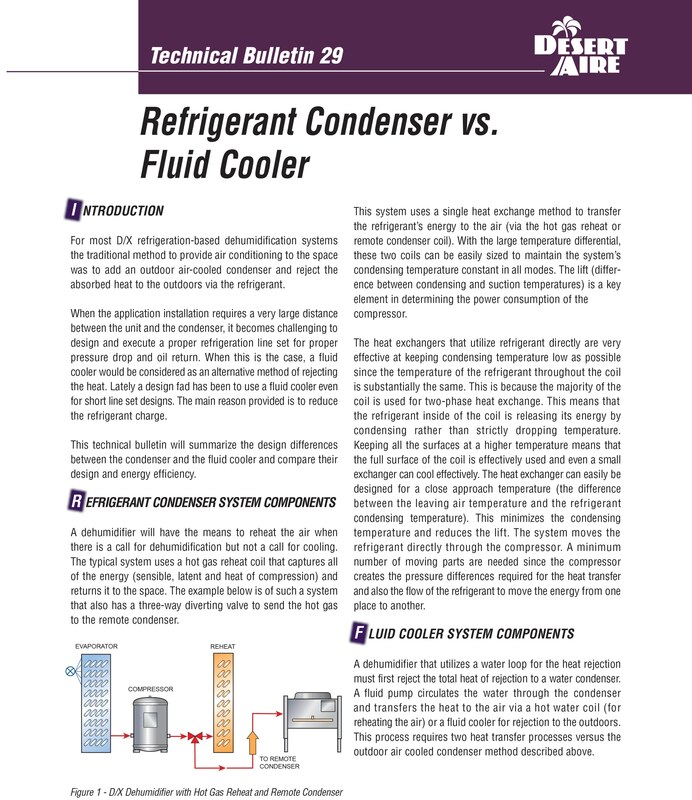 This technical bulletin will summarize the design differences between the condenser and the fluid cooler and compare their design and energy efficiency. A dehumidifier will have the means to reheat the air when there is a call for dehumidification but not a call for cooling. The typical system uses a hot gas reheat coil that captures all of the energy (sensible, latent and heat of compression) and returns it to the space. The example below is of such a system that also has a three-way diverting valve to send the hot gas to the remote condenser. This system uses a single heat exchange method to transfer the refrigerant’s energy to the air (via the hot gas reheat or remote condenser coil). With the large temperature differential, these two coils can be easily sized to maintain the system’s condensing temperature constant in all modes. The lift (difference between condensing and suction temperatures) is a key element in determining the power consumption of the compressor. The heat exchangers that utilize refrigerant directly are very effective at keeping condensing temperature low as possible since the temperature of the refrigerant throughout the coil is substantially the same. This is because the majority of the coil is used for two-phase heat exchange. This means that the refrigerant inside of the coil is releasing its energy by condensing rather than strictly dropping temperature. Keeping all the surfaces at a higher temperature means that the full surface of the coil is effectively used and even a small exchanger can cool effectively. The heat exchanger can easily be designed for a close approach temperature (the difference between the leaving air temperature and the refrigerant condensing temperature). This minimizes the condensing temperature and reduces the lift. The system moves the refrigerant directly through the compressor. A minimum number of moving parts are needed since the compressor creates the pressure differences required for the heat transfer and also the flow of the refrigerant to move the energy from one place to another. A dehumidifier that utilizes a water loop for the heat rejection must first reject the total heat of rejection to a water condenser. A fluid pump circulates the water through the condenser and transfers the heat to the air via a hot water coil (for reheating the air) or a fluid cooler for rejection to the outdoors. This process requires two heat transfer processes versus the outdoor air cooled condenser method described above. More components may increase initial costs. The pump is an additional moving part in the system that requires more energy and may require additional maintenance and service. Glycol must be added to the system and additive packages must be maintained to avoid corrosion. The additional heat exchanger in the chain requires another approach (refrigerant-to-water then water-to-air). This increases condensing pressure and lift. The single-phase heat exchange in the fluid cooler and hot water coil is less effective than more direct methods. As soon as the fluid starts to exchange energy with the air, the fluid starts to cool. This makes the subsequent portions of the heat exchanger less effective than with two-phase heat exchange where the temperature does not change. Either the heat exchanger must be designed to be larger or the lift will increase even further. AHRI Standard 910 defines Moisture Removal Efficiency (MRE) as the pounds per hour of condensate removed by the dehumidifier divided by the total kilowatts of energy needed to run the system. The powe r to run the system includes the compressor, blower/motor, transformers and pumps. Water pump electrical power to move the fluid around the water loop. A hot water coil with low temperature water is significantly larger than a D/X hot gas reheat coil. This increases the system static pressure and the dehumidifier blower must work harder. An outdoor fluid cooler’s air volume across the coil is higher than a refrigerant condenser’s air volume, thus larger size fan motors are required. An outdoor fluid cooler’s approach temperature is higher, increasing compressor energy consumption. Glycol in the water loop must be maintained and decreases the energy transfer efficiency of the fluid. This adds to the approach temperature. Although a fluid cooler loop can help to address issues with difficult installations where refrigeration line length or large liquid line risers are unavoidable, extreme care must be exercised in selecting this configuration. A reduction in refrigerant charge may be possible, but this could come at the expense of increased energy consumption and/or reduced system capacity. A fluid cooler system’s additional approach temperature of 6°F to 10°F generally increases lift by the same amount and this roughly translates to 12% to 20% efficiency decrease when compared to the conventional refrigeration condenser systems. Additional components such as higher horsepower blowers and fans plus a recirculating pump will increase the efficiency losses even more. Such a fluid cooler system would significantly increase the operational costs of an indoor pool dehumidification system which runs 24 hours per day, 365 days per year. Using a refrigerant to air exchanger provides the most effective method for optimizing the compressor power consumption and thus the unit’s efficiency and should be considered first.